Most festivals have handy information pages like this which are well worth reading for site specific information. Each festival is different so take a look before you go. My post is based on this one by Mel from Gladrags and Handbags. For other posts on this subject also check out Liv's and Poppy's. I always pop my tickets, travel cards and ID into a wallet (60p from Wilkinson's.) I keep them with me the entire time I'm at a festival because I like to get up early after the festival and head home for a nice hot shower as soon as I can. Loosing your coach/train tickets will delay getting back to your home comforts. Toilet roll (I usually take a few, there is never any in the loos at 2am), alcohol hand gel and baby wipes are must have items. 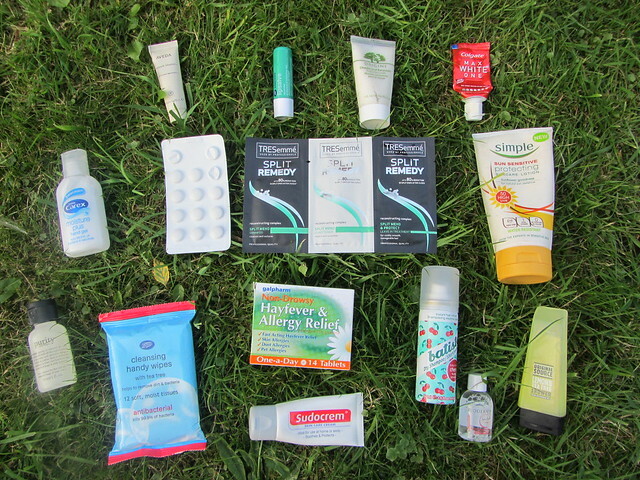 Festivals are time to forget your three step skin care routine and just use make up wipes and a basic face wash. Painkillers are always first in my bag because you don't want to traipse across the festival site when a headache/hangover looking for some of these. Hayfever Relief, plasters and suncream are handy too. I take a little sun block for my nose and shoulders and a lipbalm with SPF in. I've got miniature versions of all the toiletries I use, even if you take half empty full versions they are still to heavy and take up way too much room. I bought products that I already use so that when they are empty I can fill them up again to take on my next trip. I go away quite frequently so the miniatures were a good buy even though they are about the same price as some full size products. Dry shampoo is a must, I take a full size can because I use loads and festivals are a great time to use all those beauty box samples. Those pop up tents are not 2 man tents, you can fit one person in and there's not much room for your bag. If it rains they only have one layer and all your things get wet, avoid like the plague! I had one at Reading 2009 and regretted the decision to buy one. If you're only going to one festival and don't intend on going again why not borrow a tent? Someone has usually got one lurking in their attic that will do the job perfectly well for three days. Supermarkets also do great deals where you can pick up a tent, roll mat and sleeping bag for around £40. I will be taking my inflatable mattress to Bestival which I picked up from Surfdome who sell all sorts of handy festival essentials, there's nothing worse than a bad nights sleep. I know lots of bloggers look super glam at festivals and celebs sashay around site in designer dresses but these people stay in hotels, have VIP camping or just pop in for the day. You're going to be there for about 4 days with no GHDs, possibly in the rain and getting drenched in beer if you like standing right down the front like I do. I never take nice clothes to festivals and wear dark colours or patterns so if you get a little dirty nobody will notice. I wear my favourite Orphans Arms t-shirt to festivals all the time, it's well worn and doesn't crease easily, denim shorts can be worn a few times so you end up carrying less and I always pack plenty of jersey dresses like this one which I normally don't pay more than £15 for. I'll be taking my Zatchels bag with me this year as it's very secure, it has a buckle underneath so nobody can have easy access to my cash or phone. A lightweight waterproof jacket is always a must for festivals, get one that you can roll up in your bag and whip out at the first sign of a shower. My top tip when it comes to clothes is take loads of layers, temperatures plummet at night and you will be shivering in your tent without a huge hoody and socks. 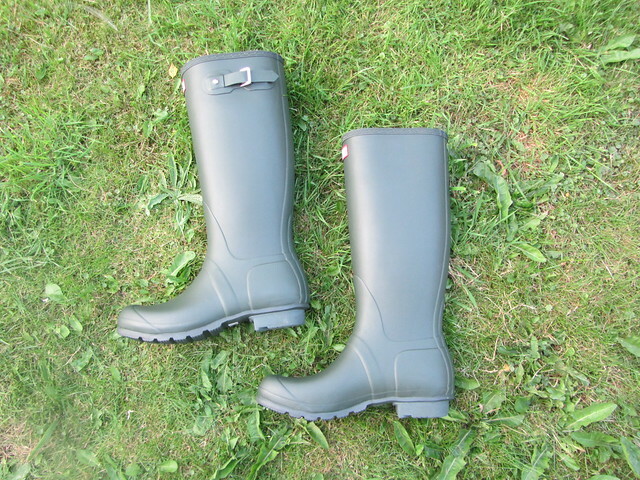 Take wellington boots, even if its forecast to be sunny every day it's better to be prepared, there's bound to be a shower at some point over the weekend. I also take my trusty pair of black converse shoes because even my Hunter wellington boots can rub a little and start to feel heavy after a few days. I also pack flip flops for the showers because they can be a little gross. If it rains you wont want to sit a puddle of mud so a camping chair or a picnic rug backed with plastic (like my Poundland one) will be very useful. Essential for late night trips to the loo or finding something in your bag when it's dark. For your camera, torch and you could also pack a spare phone battery to avoid paying for a charger. Take an empty water bottle, there are always drinking water taps in the arena.If you're taking alcohol make sure its decanted into plastic bottles, glass is never allowed on site. You can get a Wagamamas and MEATliqour burger at festivals like Bestival now so don't waste too much money packing food that you wont eat, enjoy some of the tasty things on site and avoid a really heavy backpack. 1.Bring your own food and drink and a couple of cooler bags to keep things fresh. Where you can, buy dried food as this won’t go off and avoid bringing glass to festivals. Don't try and carry too much stuff though, you can get most things on site or at a local supermarket. 2.Chances are at some point it will rain so keep your clothing cheap and cheerful, with at least one waterproof top. There is a fair chance you’ll be throwing some of it away at the end of your stay! 3.Buy tickets direct from the festival websites to avoid surcharges and steer clear of tickets being resold online unless you are buying from an authorised dealer. Festivals, like big sports events, attract fraudsters. 4.Think about the weather and how much time you are spending outside. There will be people selling wellies and/or sun cream onsite but you can expect to pay 200% more so make sure you are covered for all eventualities. 5.Not everyone comes to enjoy the music. Festivals are a big draw for thieves and fraudsters. Make sure your insurance covers anything expensive – like cameras – or simply leave them at home. 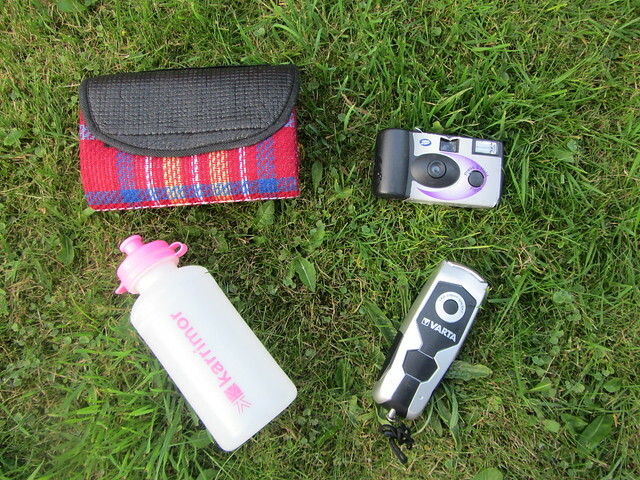 I take disposable cameras and my old nokia phone. Lots of good advice, although I'm not sure the festival thing is for me. I like camping, I like music, so it's one of those things I can't really explain.